Apparently, the Dutchman did not think highly enough of the Spanish keeper and wanted Real Madrid keeper, Keylor Navas at the club. The story will be backed up by Van Gaal’s admission earlier on this season when he said that he had no idea De Gea could be this good. The Spaniard has been the best player at the club for over a year now, but the manager admitted that he was pleasantly surprised to discover just how good De Gea is. 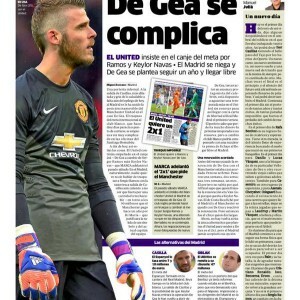 Marca claim that De Gea agreed on the renewal at the start of the season, but Van Gaal did not sanction it then as he harboured doubts over De Gea’s quality.